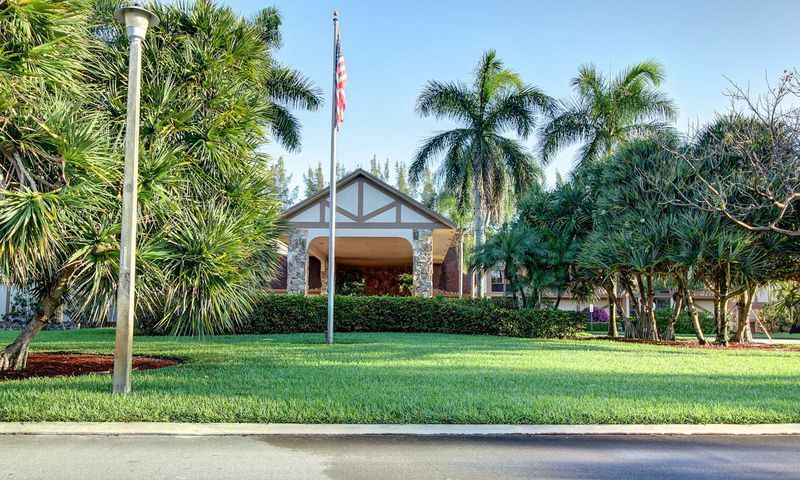 Huntington Lakes in Delray Beach, Florida is a condominium community for those 55 and better. Residents enjoy a grand clubhouse with numerous amenities geared towards staying active and social. This gated community is comprised of 2,100 condominium units available on a resale-only basis. The surrounding area offers lush tropical landscapes and a relaxed beach-town vibe. Shopping and entertainment options are all within a few miles from Huntington Lakes making running errands easy. At the center of Huntington Lakes is the 50,000 square-foot clubhouse. Here, homeowners enjoy a myriad of amenities and activities which enable them to stay socially and physically active. Residents looking to stay in shape can use the fitness center with cardiovascular equipment and strength-training machines or join a water aerobics class at the indoor pool. Those looking to stay more socially active will enjoy the hobby and game rooms, where residents can always join a game of cards or dominoes. Continuing education classes meet in one of the multi-purpose rooms to create opportunities for lifelong learning. There is also an arts and crafts room, computer room, and library for those looking for a quiet place to relax. The amenities continue with nine outdoor swimming pools, six bocce ball courts, and 22 shuffleboard courts spread across the community. Tennis enthusiasts enjoy the nine Har-Tru tennis courts located by the clubhouse with community tournaments scheduled regularly. Behind the clubhouse residents can also relax and enjoy each others company on the spacious patio. Oriole Homes built 2,100 condominium units between 1980 to 1989. Each unit ranges between 990 and 1,200 square feet of living space with one to two bedrooms, one to two bathrooms and ample parking in the building lots. These units are located in secured buildings between four and eight stories. Each unit offers open floor plans and screened-in back porches with scenic golf course or water views. These condos offer the best in low-maintenance living. Residents of Huntington Lakes enjoy an active and low-maintenance lifestyle. Homeowners pay a reasonable annual fee to the community homeowners' association. This fee covers general maintenance of the clubhouse and community grounds as well as basic cable and exterior care of the condo buildings. This low-maintenance lifestyle allows residents to plan their days around what they want to do. A full-time clubhouse manager ensures there is a calendar full of activities each month for the residents. Some favorites among homeowners are the boomers club, bridge club, tennis club, and the volunteer program. Huntington Lakes is situated just east of the Florida Turnpike in Delray Beach, Florida. Residents enjoy numerous options for shopping and entertainment just outside of the community gates. Golfers love the myriad of public and private courses found in this area with play for all skill levels. Day trips to the local coastal beaches is one of the favorite activities for residents of Huntington Lakes. With a beautiful year-round climate and never-ending activities it's obvious to see why active adults from across the country choose Huntington Lakes. There are plenty of activities available in Huntington Lakes. Here is a sample of some of the clubs, activities and classes offered here. Each unit ranges between 990 to 1,200 square feet of living space with one to two bedrooms, one to two bathrooms and ample parking in the building lots. These units are located in secured buildings between four and eight stories. Each unit offers open floor plans and screened-in back porches with scenic golf course or water views. Please Note: Floor plans are not available at this time. I've lived at Huntington Lakes for about 2 years and love my condo here. Delray Beach is a great area with plenty to do, wonderful shopping and restaurants, great beaches, golf and most important for me, all my friends are here! My condo at Huntington Lakes fit very well within my budget so I have plenty left over to shop, go out with friends and travel! 55places.com is not affiliated with the developer(s) or homeowners association of Huntington Lakes. The information you submit is distributed to a 55places.com Partner Agent, who is a licensed real estate agent. The information regarding Huntington Lakes has not been verified or approved by the developer or homeowners association. Please verify all information prior to purchasing. 55places.com is not responsible for any errors regarding the information displayed on this website.